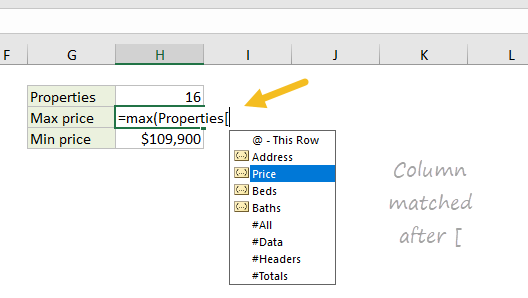 Excel Tables have a confusingly generic name, but they are packed with useful features. If you need a range that expands to include new data, and if you want formulas that automatically stay up to date, Excel Tables are for you. This article provides an overview. You can create an Excel Table in less than 10 seconds. First, remove blank rows and make sure all columns have a unique name, then put the cursor anywhere in the data and use the keyboard shortcut Control + T. When you click OK, Excel will create the table. Like named ranges, tables will appear in the namebox dropdown menu. Just click the menu, and select the table. Excel will navigate to the table, even if it's on a different tab in a workbook. When you convert regular data to an Excel Table, almost every shortcut you know works better. For example, you can select rows with shift + space, and columns with control + space. These shortcuts make selections that run precisely to the edge of the table, even when you can't see the edge of the table. Watch the video below for a quick rundown. Tables make it much easier to rearrange data with drag and drop. After you've selected a table row or column, simply drag to a new location. Excel will quietly insert the selection at the new location, without complaining about overwriting data. Note: you must select the entire row or column. For columns, that includes the header. One frustration when working with a large set of data is that table headers disappear as you scroll down the table. Tables solve this problem in a clever way. When column headers scroll off the top of the table, Excel silently replaces worksheet columns with table headers. 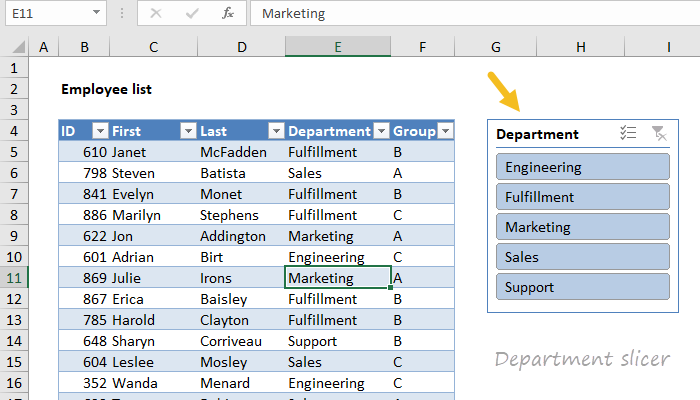 When new rows or columns are added to an Excel Table, the table expands to enclose them. In a similar way, a table automatically contracts when rows or columns are deleted. When combined with structured references (see below) this gives you a dynamic range to use with formulas. All tables can display an optional Total Row. The Total Row can be easily configured to perform operations like SUM and COUNT without entering a formula. When the table is filtered, these totals will automatically calculate on visible rows only. You can toggle the Total Row on and off with the shortcut control + shift + T.
All tables are automatically assigned a generic name like Table1, Table2, etc. However, you can rename a table at any time. Select any cell in the table and enter a new name on the Table Tools menu. Tables have a feature called calculated columns that makes entering and maintaining formulas easier and more accurate. When you enter a standard formula in a column, the formula is automatically copied throughout the column, with no need for copy and paste. The same feature also handles formula changes. If you make a change to the formula anywhere in a calculated column, the formula is updated throughout the entire column. In the screen below, the tax rate has been changed to 7% in one step. Another way to enter structured references is by typing. When you type the first few letters of a table in a formula, Excel will list matching table names below. Use the arrow keys to select and the TAB key to confirm. To enter a column name, enter an opening square bracket ([) after the table name follow the same process - type a few letters, select with arrow keys, and use TAB to confirm. All Excel tables have a style applied by default, but you can change this at any time. Select any cell in the table and use the Table Styles menu on the Table Tools tab of the ribbon. With one click, the table will inherit the new style. Table formatting is not a requirement of Excel tables. To use a table without formatting, select the first style in the styles menu, which is called "None". Tip: you can use this style to remove all table formatting before converting a table back to a normal range. 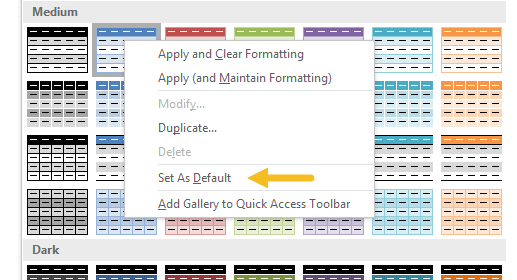 You can right-click any style and choose "Set as Default". New tables in the same workbook will now use the default you set. Note: to set a default table style in new workbooks, create a custom start-up template as described in this article. In the template file, set the default table style of your choice. When you use a table as the source for a pivot table, the pivot table will automatically stay up to date with changes in data. Watch the video below to see how this works. Tables are a great way to create dynamic charts. New data in the table will automatically appear in the chart, and charts will exclude filtered rows by default. Although all tables get filter controls by default, you can also add a slicer to a table, to make it easy to filter data with large buttons. To add a slicer to a table, click the Insert Slicer button on the Design tab of the Table Tools menu. To get rid of a table, use the Convert to Range command on the Table Tools tab of the ribbon. You might be surprised to see that converting a table back to a normal range doesn't remove formatting. To remove table formatting, first apply the "None" table style, then use "Convert to Range".